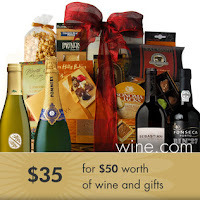 Pay $35 for $50 Worth of Wine & More from Wine.com! For a limited time at Zulily, you can get a $50 Wine.com credit voucher for only $35! With it, you can choose from over 90 wines prices under $20, wine accessories, gift baskets and much more. If you order by 12/18, you'll get guaranteed Christmas delivery!